Synopsis: It’s time to meet your new roomie. My review: I am speechless. 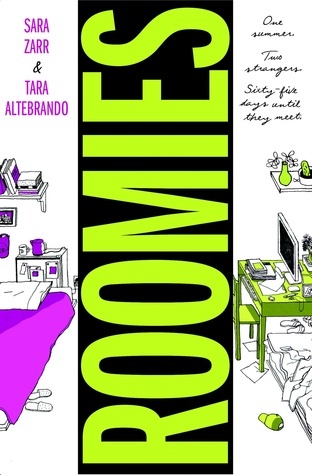 Roomies completely captured not only the inner turmoil and emotional rollercoaster of leaving home and going off to college, but also those first fears of meeting your roommate for the first time and wondering if you will get along and be okay living with each other for the first year of college. The authors were able to capture the thoughts of both girls in a switching point of view storytelling manner and I thought this highly benefited the novel because then the readers could connect with each girl individually while also having that outside looking in sort of viewpoint. The story starts from the point of view of Elizabeth or “EB” and she lives in New Jersey and is flying all the way out to Berkeley California to go to college. A daunting task on its own, she also must deal with the fact that she might possibly run into her gay dad (who separated from her and her mom when she was a little girl). Elizabeth must also navigate around her mom and her mom’s constant slew of boyfriends, one of whom may ruin her relationship with a new boy that she has just met. Add to that the fact that this new boy she met is only moving to Chicago to go to college and she may not want to leave after all…? Well, like any other normal teenage girl embarking on a very important part of her life, she’s confused. Alternately, Lauren is her future roommate who lives in San Francisco and is simply moving across the Bay to go to Berkeley. However, this short trip also seems huge and daunting considering that she is extremely close with her family and also has just met a guy who will be going to college in Chico (about 3 hours away from Berkeley). Lauren’s struggle to come to terms with the fact that she will have a roommate after she specifically requested a single is overcome by the fact that she and Elizabeth have a common need; the need to have an outsiders opinion on the happenings of their lives during the summer. Both girls are going through a similar experience with lot’s of tears and goodbyes and having each other to email back and forth not only helps solidify a friendship before they even get to college, but also connects them on a deeper level of understanding. Personally, as someone who has moved away from home for college I know what it’s like to feel scared and confused but also excited to get out and see a new part of the world. I think the authors totally and completely captured the scary transition between college and high school. And that’s what makes this book unique. I’ve never read a story where it discusses the transition between high school and college; the characters were always in one situation or the other already. It was a very refreshing read and much deeper than I thought it would be. I found myself laughing and coming close to tears along with the girls as they navigated their last summer’s at home. And I think these girls will get along a lot better than my roommate and I did! As much as I would love for their to be a sequel, and I doubt there will be, I actually like how the book ended, as it keeps the characters in that sort of limbo of the summer and let’s the readers decide what will happen next. I 100% recommend this for girls who are going to be going to college next year or are already in college and want to reminisce about that first year. Above all it’s an adorable story.